This winter flavor-filled apple toast is a new way to take on Toast Tuesday. 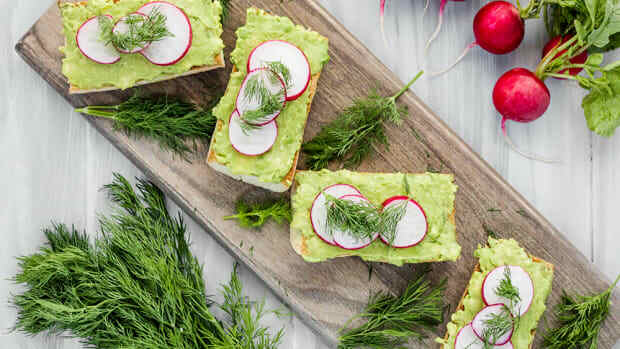 Avocado toast, step aside. 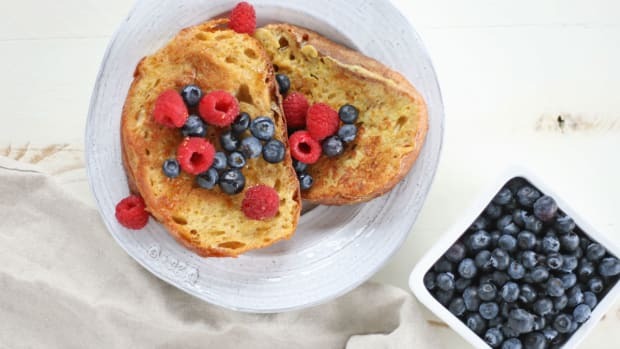 Call it a bread revolution; everything is going on toast these days. From cauliflower to hummus, bananas, ghee, olives, sauerkraut, and more, toast is the new vessel. 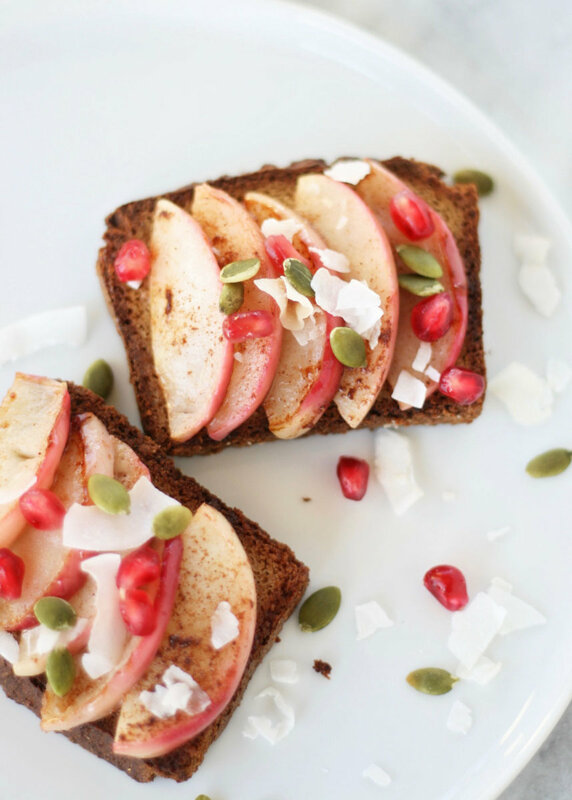 This sweet toast is a delicious way to incorporate wholesome ingredients and winter flavors like cinnamon, apple, and pomegranate. Plus, this apple toast is easily adapted to a variety of diets including paleo, gluten-free, and vegan. When it comes to choosing the perfect piece of toast, look for bread with minimal ingredients. 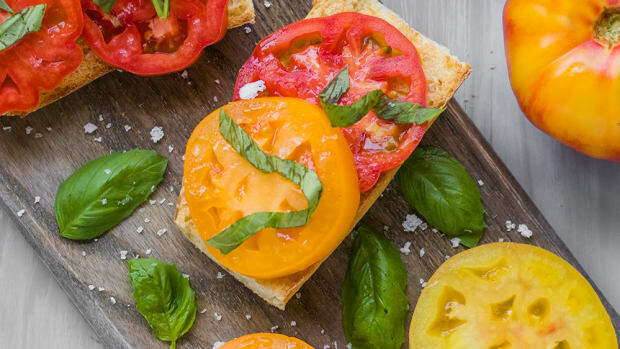 There are a variety of high-quality Paleo-friendly breads and gluten-free breads that don’t contain upwards of 20-plus ingredients. Other delicious breads that taste amazing when toasted are hearty slices of sourdough and whole wheat bread. If possible, snag a local and organic loaf at the neighborhood bakery. While the bread is being toasted, begin to sauté the apples. I love using a firm, tart apple to really make the other ingredients shine. 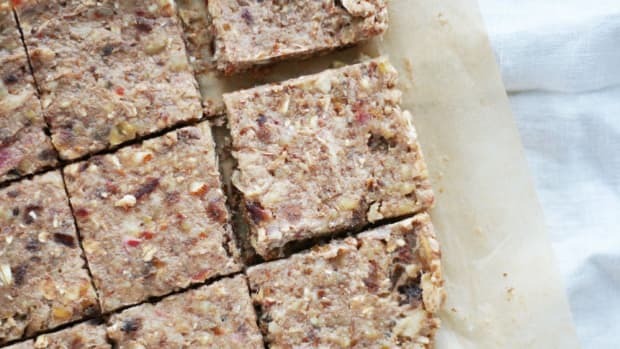 Honey crisp apples and fuji apples are delicious in this recipe and don’t turn to mush when cooked, like other varieties. Always go with an organic apple, which hasn’t been doused in a variety of chemicals and pesticides. The Environmental Working Group (EWG) frequently finds that apples are one of the most heavily sprayed fruits. Apples are sautéed in ghee, also known as clarified butter, in this apple toast recipe, but using coconut oil works deliciously too and makes the recipe vegan. As apples cook and bubble, sprinkle them with cinnamon and nutmeg for the perfect hint of warmth and rich flavor. I promise your kitchen will smell heavenly. 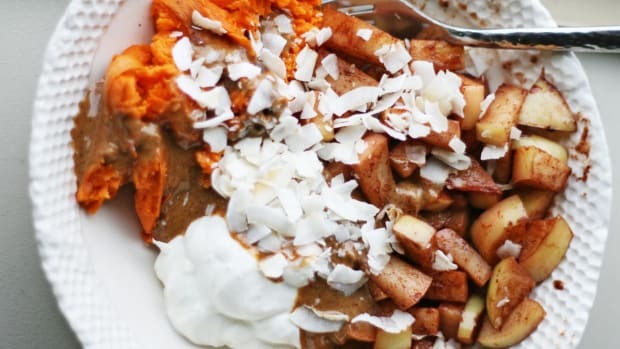 Once the apples are finished being sautéed, it’s time to top the toast. 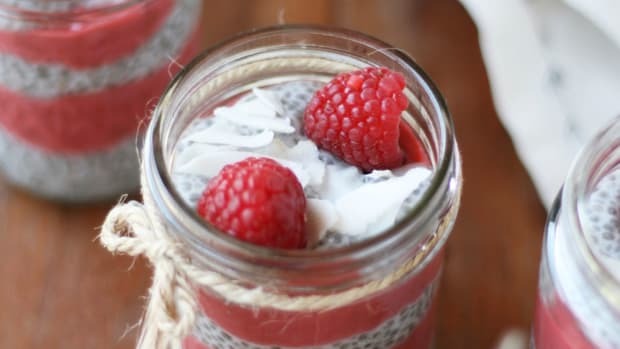 Lovingly layer slices of sautéed apple on toasted bread and sprinkle with coconut flakes, sweet pomegranate seeds, and crunchy pumpkin seeds. 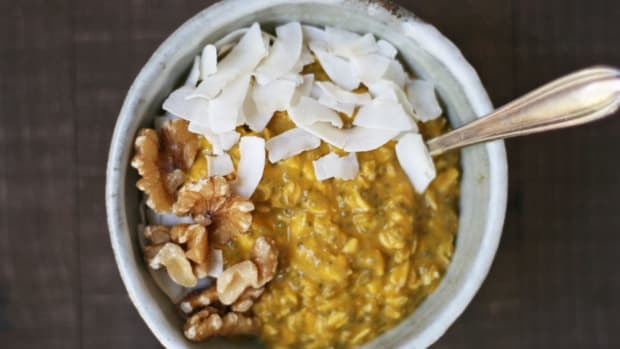 For extra oomph, drizzle with nut butter or sprinkle with dark chocolate chips. Cozy on up and enjoy the apple toast warm with a cup of hot tea – yum. 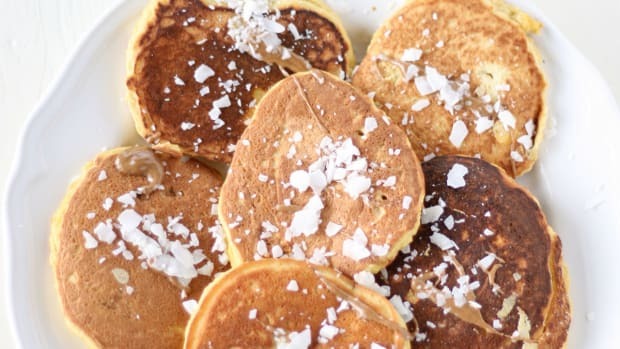 While bread is toasting, heat ghee or coconut oil in a small skillet over medium heat. Add apple slices in a single layer and sauté for two to three minutes per side, or until slightly soft. Sprinkle with spices and sauté one minute longer. 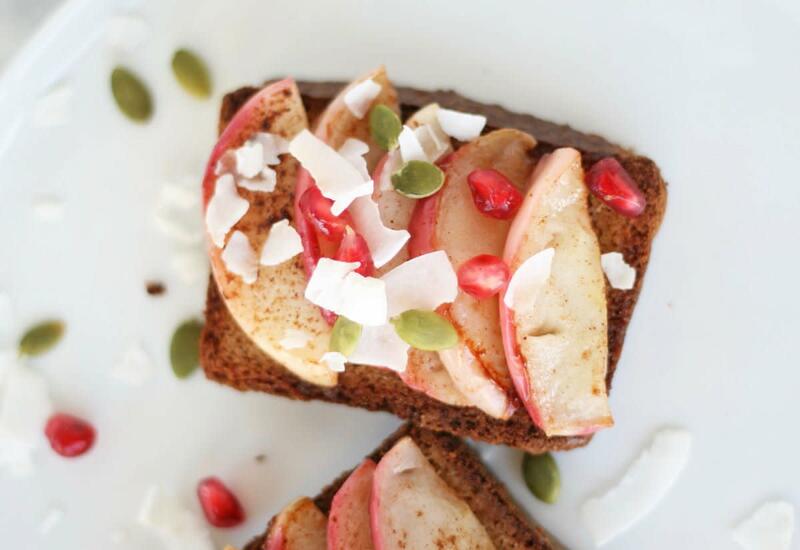 Spoon warm apple slices onto toast and top with pomegranate, pumpkin seeds, and coconut flakes. Enjoy!